Excuse us for living, but the monumental storm Sandy, plus the Presidential Election sandwiched amidst our struggle in the storm’s aftermath, were collectively another notch in what has become my mantra. We are just trying to make our way through our retirement years that we had looked forward to with optimism and bright expectations. Then, first came the Great Recession and now this. Our hearts are heavy with the loss of life and property up and down the east coast into New England. But the devastation of the storm’s landfall right on the New Jersey shore, and the destruction to New York City and the immediate area, are more than people can bear. So having been dealt lemons, as the saying goes, let’s see if we can make some lemonade out of all of this. 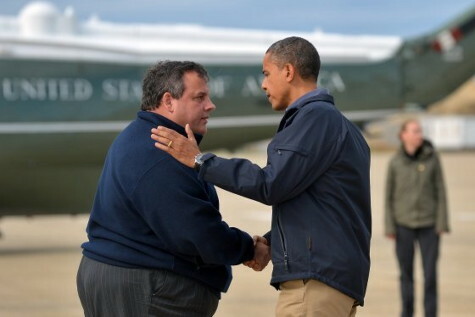 President Obama & Governor Christie toured the ravaged New Jersey shore in Marine One. 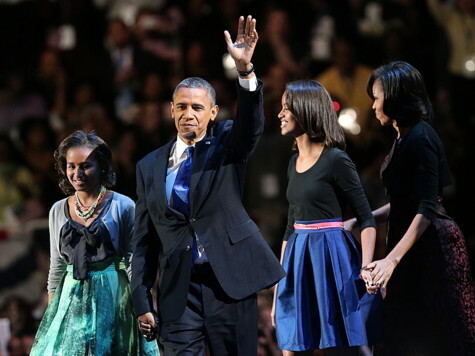 And one more thought to tie this together…the Election and Storm Sandy. The economy. Jobs are #1. Accept reality. Spaceship earth’s environment is changing. We must live/build in harmony with it, preserve it, the only earth we have! Put aside labels like “global warming” and “climate change,” if that helps bring us together, and just look out the window. The weather’s gales and the ocean’s waves will tell you the conditions we face. This is about survival. Jobs are issue #1 and so rebuilding from Sandy in our states and a green environment and energy and infrastructure nationally all interrelate/combine into “job one.” And while we are at it, how about rebuilding our industrial base to help us get the work done! We can’t have life as we know it without working ON and AT that piece of terra firma we call Home and our Nation too! 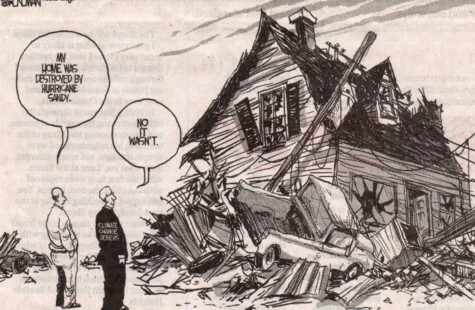 Left, “My home was destroyed by Hurricane Sandy.” Right, “No it wasn’t.” The Man in the dark suit is labeled, “Climate Change Deniers,” as it appeared in The Star-Ledger newspaper in the days following storm Sandy. Excuse us for living, in whatever form, life goes on until we die. In the meantime, let us survive! As you have already guessed, I am a dyed in the wool Republican. I was very upset that my candidate lost. But having said that, I do hope that both parties can “reach across the aisle” and work together to insure that jobs are #1! We need to get this economy going-it is imperative that happens Phil. I did not know that fact; that Sandy was second in dollar loss, with Katrina being first. I am so grateful that Erin and Andy(and Mr Bart too) could stay warm in your home. Erin and I were communicating and things were bad in their rental: temps in the 50’s…yikes! p.s. a Happy Thanksgiving to you, Gerri & your family! Thanks, Margaret…..May you all enjoy Thanksgiving too! Those photos of Erin & Andy’s “Park” trees down on FB said it all! I agree Phil, the election is over so let’s move on. Let’s put down the boxing gloves. No, let’s put the boxing gloves over our ears and stop listening to the fringes of both parties and the nonsense they come up with to keep us separated because “divided we fall,” and they count on that. Instead, it is time for us to unite and demand that congress work together for the sake of our country (rather than the benefit of their party nd the next election). They already know what needs to be done…let’s insist they do it. Yes! Let us all give Thanks. The Pacheco’s have given another try at moving forward. We just locked in our Electric rate for 12cents a kilowatt for 20 years. The “PV”Solar system rate will not rise for that long. The local utility might raise theirs though. We try and buy as little from them, though we must. Battery technology will improve. So our backup one day soon may be our wonderful sunshine. Solar City was the company that won our business. Citizenre after 6 years. Wow my how time flies. Was just not the right horse in a race to produce clean, renewable power on a massive scale. Solar City has a good rate,but you must have a good credit rating above 720. Citizenre wanted to supply all the potential customers. Not a substantial interest in this level. Thus not enough investment capitol. Hope more. Unite for clean power as soon as possible. The inhabitants on earth need a clean and stable environment. As our Western culture and all the neat technology continue to proliferate this is what we should investigate. Come together for jobs, environment. Lean forward. It might hurt some of the easy utility dividend stocks. But what good is money if you have to spend it on a storm every two years to repair the damage from environmental disruption. Sounds like Solar City was “the move” for you. Good decision from all you say. Is Citizenre dead or still on hold? Have you stopped representing them? And you know I could not agree more that we must bring it all together from the environment to jobs & rebuilding smartly. It may hurt to be told that certain areas must be left to nature but so it must be.